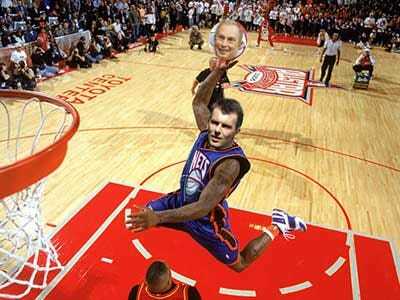 Bloomberg BusinessWeek’s long feature on the “only NBA owner who can dunk” is such a wet kiss that even the Star-Ledger has decided Mikhail Prokhorov is a sweetheart. Prokhorov, Russia’s second-richest man, according to Moscow’s Finans magazine, was little known in the U.S. until last year, when he agreed to pay $200 million for an 80 per cent stake in the Nets and a 45 per cent share in their new Brooklyn arena. He’s not bothered that the Nets were one of the worst teams in the history of professional basketball in the 2010 season, with a record of 8-63 on March 25. Veteran journalist John Helmer called out Bloomberg reporters for obscuring facts about the billionaire’s finances, his billion-dollar default in 1998, and his prostitute-related arrest in 2007.
in your report of the January 2007 Courchevel arrest and the subsequent imprisonment of Mr Prokhorov in Lyon, and the investigation that followed for two further years, you appear to have ignored the evidence of obstruction of justice and blocking of efforts of the French investigating magistrates to question witnesses and pursue evidence? Are you unaware of the documented French evidence, published in the French press, suggesting that Mr Prokhorov used influence with Russian officials to prevent the French investigation from being undertaken and completed? in your report of the founding and operation of Mr Prokhorov’s Uneximbank, you report: “Doing business in Russia in the 1990s came down to survival of the fittest”. You also report that “the Soviet banking system began collapsing with the fall of communism”. Is there a reason you omit to report that Uneximbank collapsed in 1998, defaulting on an estimated $1 billion in liabilities? To whom should the responsibility, fault or credit for that bank failure go? Why do you withhold from your readers the evidence that such a milestone venture in Mr Prokhorov’s career went bankrupt? there are two other omissions of the record of Mr Prokhorov, which your article reveals. Have you omitted recent statements by high-ranking Russian and US officials, casting negative light on Mr Prokhorov’s character and business practices, because you were intending to do, or had agreed with Mr Prokhorov, to do a promotion? Or because you were unaware of the officials and their criticisms? The first of the criticisms of Mr Prokhorov came from the Prime Minister of Russia, Vladimir Putin, who criticised him for his management of the utility company TGK-4 for what might — in another country or in another medium than Bloomberg Markets — be called investment contract violations or cash stripping. Mr Putin made his statement on February 24. Also, according to Admiral Dennis Blair, the US Government’s Director of National Intelligence, Mr Prokhorov’s line of business in precious metals makes him susceptible to, or a witting party to, the “growing nexus in Russian and Eurasian states among government, organised crime, intelligence services, and big business figures. An increasing risk from Russian organised crime is that criminals and criminally linked oligarchs will enhance the ability of state or state-allied actors to undermine competition in gas, oil, aluminium, and precious metals markets.” Admiral Blair made this and related statements in testimony to the US Senate Select Committee on Intelligence on February 2. Did you miss it? Not to mention the fact (thanks etindell) that Bloomberg’s headline plainly disregards at least one other NBA owner who can dunk.